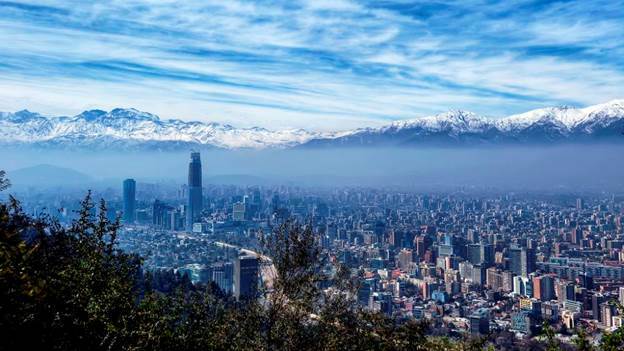 March 5 – March 6, 2016: Fly from Toronto, Canada to Santiago, Chile. Take airport shuttle to hotel. 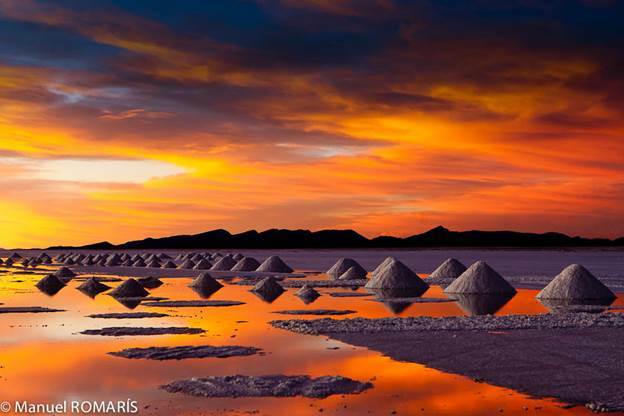 March 7 – March 11, 2016: Fly from Santiago to Calama (Chile), take Transfer Licancabur bus from Calama airport to San Pedro de Atacama (Chile). 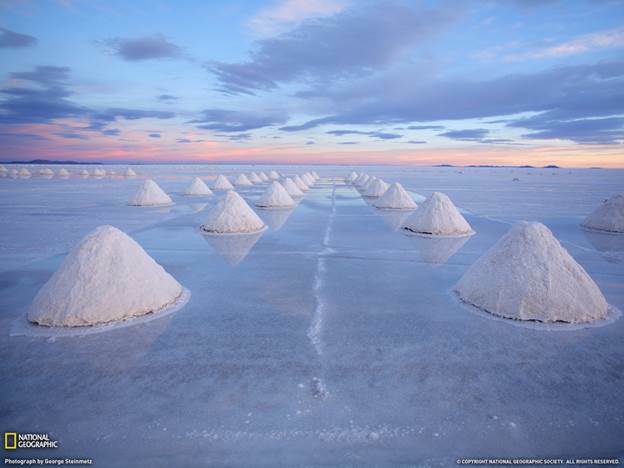 Join 4 day Salt Flats tour from San Pedro de Atacama, Chile to Uyuni, Bolivia, and then back to San Pedro de Atacama, Chile. 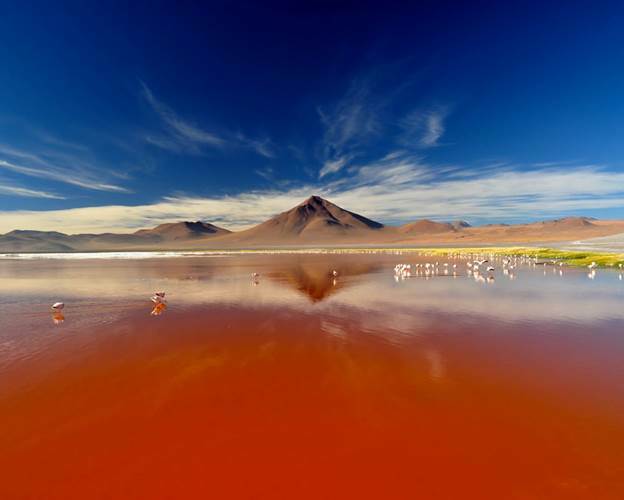 Take Transfer Licancabur bus from San Pedro de Atacama to Calama. 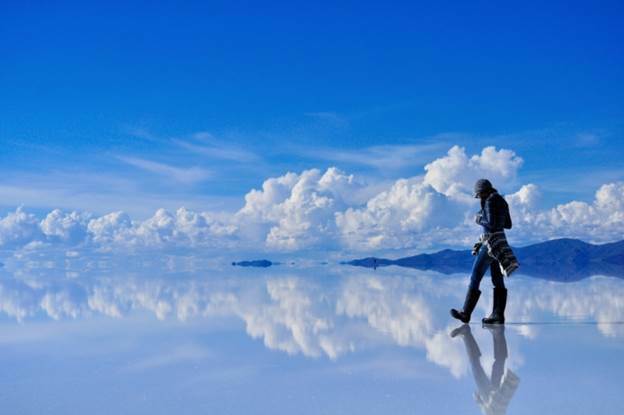 Trips to the Salar de Uyuni are an unforgettable experience but unfortunately the general standard of facilities and services are not very high in this remote area. We would like to make it clear that things are not as reliable, comfortable and professional as we would like on these tours so for this reason we do not promise more than what you will receive for your money. The accommodations & food will be basic, the driver acts as a basic guide but he is unlikely to speak any English, or if he does it won’t be a good level. Due to the harshness of the terrain vehicle breakdowns are common. Still interested? Good, you should be because if you can put up with a bit of hardship you should have a great time. It is not essential to have an English speaking guide for this tour as most of it is looking at landscapes and these are pretty self-explanatory. Take some extra snacks, plenty of warm clothes and a sleeping bag (can be rented) and the accommodations won’t feel so bad. The drivers are used to breakdowns and are pretty adept at fixing their vehicles, they are always willing to help each other out and you are usually not stuck for long - so a bit of patience is often all you need. 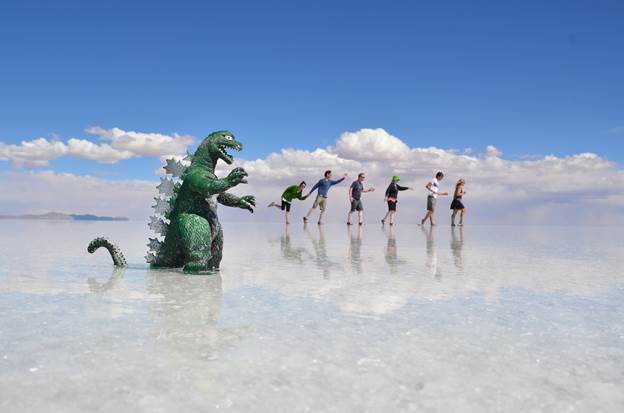 We believe if you are informed truthfully about the possible negative aspects of the tours you can prepare yourself better and will have a more positive experience. The following is a typical tour but sometimes some things are omitted from a tour (for example during rainy season), sometimes additional things are included, so this shouldn’t be seen as a rigid itinerary, although the most popular main sites are always included.. If there is something you really want included your group should stress this to your driver at the start of the tour so he can plan accordingly. 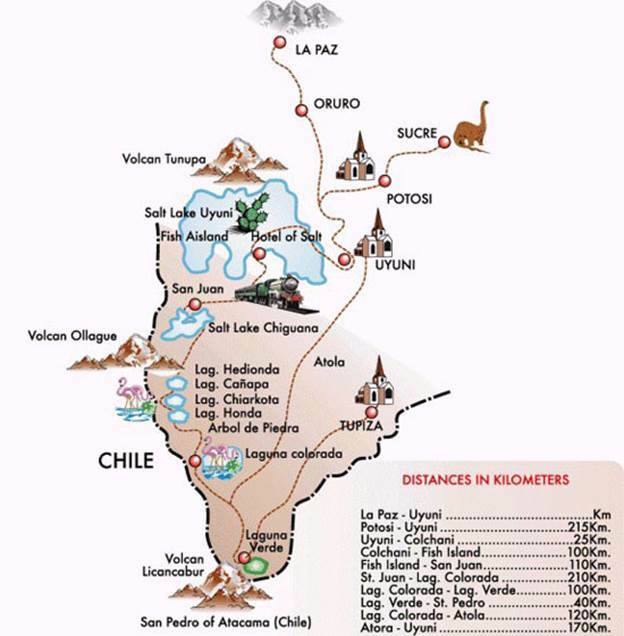 Basically this is a tour to the high altitude, with shared dorm-type basic hotels (you need to bring your sleeping bags for the cold weather). Condition for this tour is very harsh; this is why we do it first in the trip! 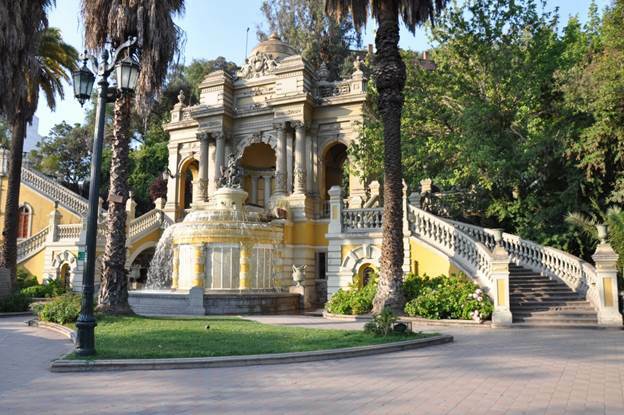 If you do not like this type of arrangement, you can join the trip from March 12 which is the day we fly from Santiago to Eastern Island (You need to arrive in Santiago Chile in early afternoon on March 12 to catch up the flight to Eastern Island). 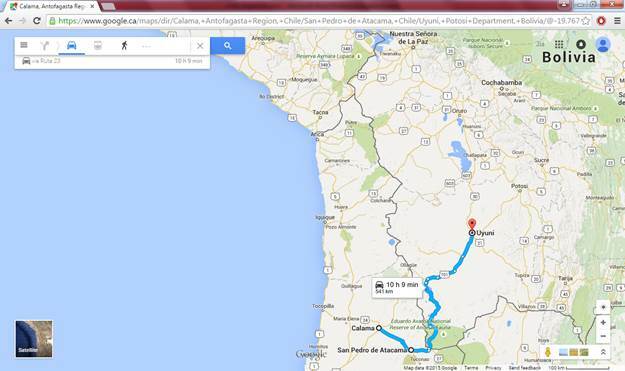 You will be picked up from your central hotel in San Pedro de Atacama around 8am to be taken to the border at Hito Cajon (border of Chile /Bolivia). After passing through the border formalities it is a short journey to reach Laguna Verde where we will see the emerald green waters of this mineral rich lake (n.b. 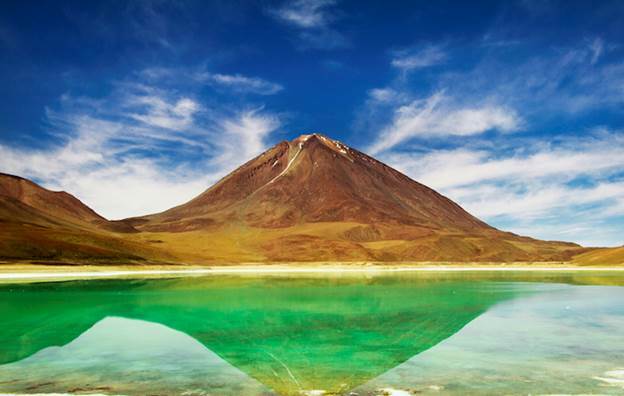 only green if there is some wind churning up the mineral - if calm there is a beautiful reflection of the volcanoes). 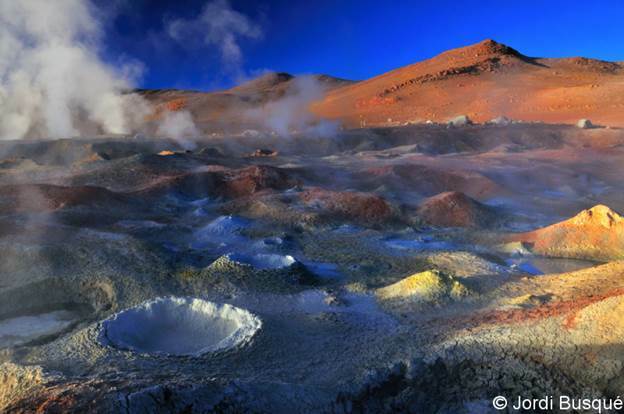 We then head towards the geysers "Sol de Mañana" to witness the bubbling hot mud pools and shooting of steam many meters into the air. 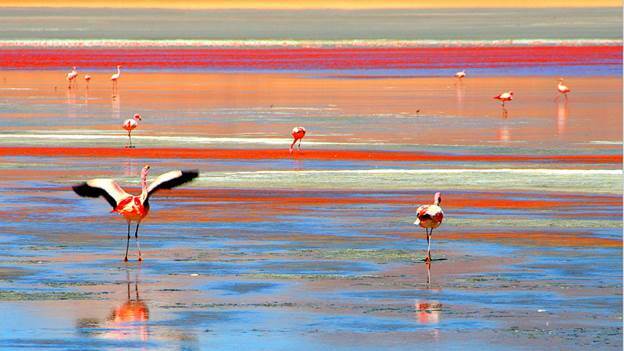 Next stop will be Laguna Colorada - a fascinating lake with red water and we can see many flamingos feeding along its shores. Here we will stay in a basic hotel for the night. We depart on this second day after breakfast around 8am and we have a chance to see Laguna Colorada again as we pass by a different side of the lake. 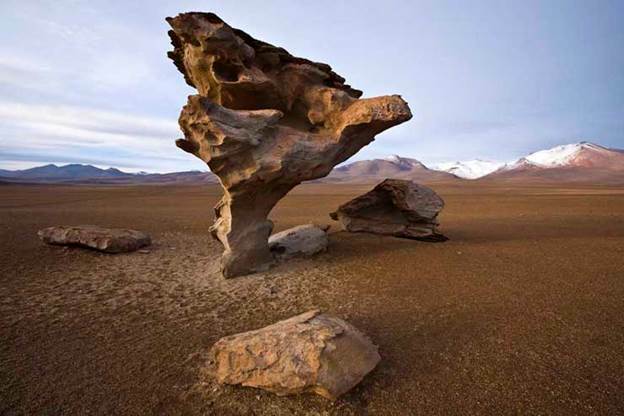 We will travel through the Siloli desert area and see surreal rock formations. 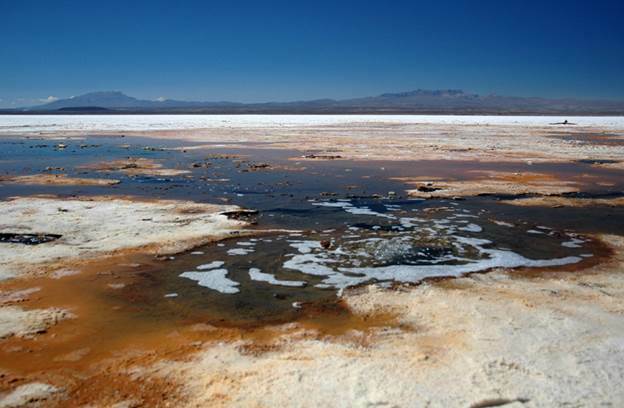 Further along today we pass by Laguna Honda to witness its sulphur smell and pass by some other high altiplano lakes. In the evening we arrive in the town of San Juan where we will stay the night. 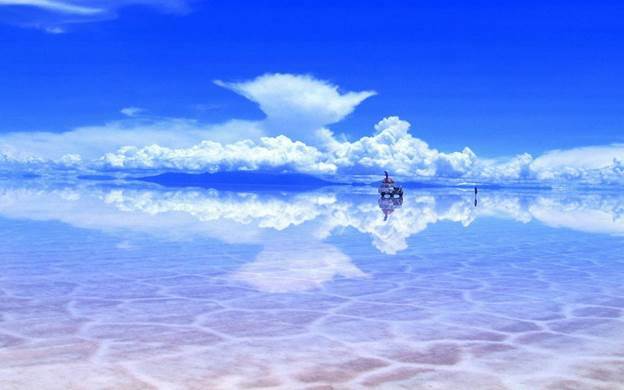 Today we will visit the amazing salt flats. 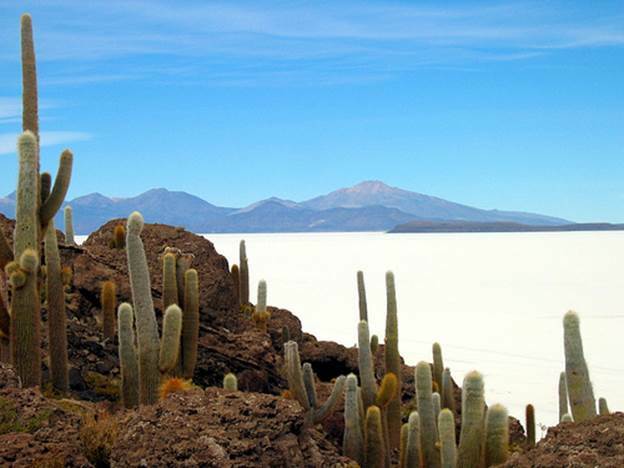 Here we will see the "ojos del sal" were water is bubbling up through holes in the Salar, we will see where local workers gather salt into mounds and visit Isla Incahausi (also referred to as Isla Pescado) where we will find giant cacti and have great panoramic views of the surrounding salt flats. 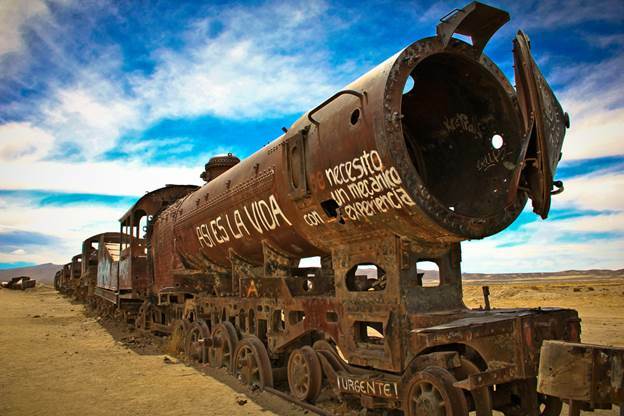 After leaving the salt flats we will visit the town of Colchani to see how the salt is processed and you can also ask your driver if he can take you to the Train Cemetery for the final stop on the tour before arriving in Uyuni. 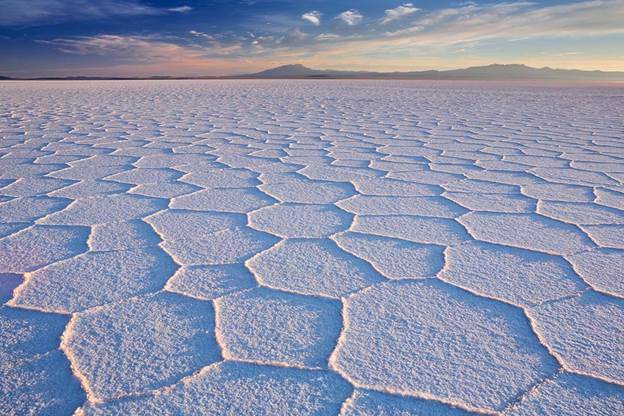 There will be plenty of time to stop and take photographs of the incredible salt flats throughout the day before we arrive to Uyuni in the evening around pm. We will rest for a couple of hours before setting off for our accommodations in Villa Mar. 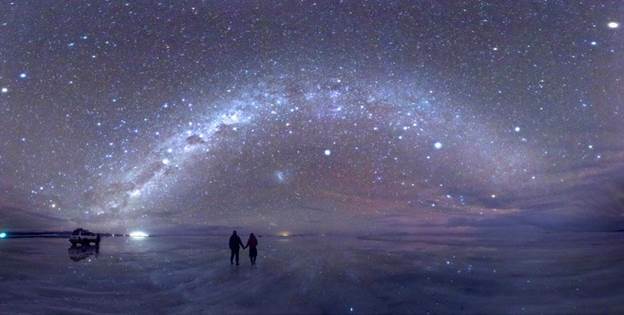 For regular tour ($240/person), we do not get to visit the salt flat at sunset and night, but we can do this with a private tour. For private tour, we can also get single room with private bathroom (sleep bag still needed) for 3 nights, however, it will cost $2860USD / how many people we have (up to 6 people). We set off early (leaving 5am) for the return to San Pedro de Atacama arriving around midday approximately in San Pedro. Please note that this day is just a transfer and not a tour - there will be no sightseeing or stops for photos etc. 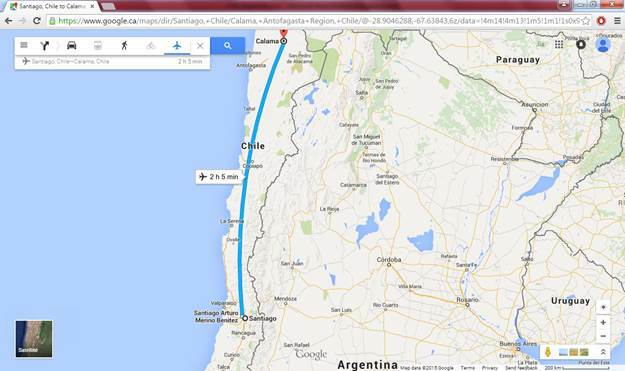 We will arrive in San Pedro (Chile) around 14:30, and we will take a 90 min bus to Calama (Chile), and stay in a 5 star hotel there for 1 night to recover from the trip. © 2016 south-america-trip.maplist.org. All rights reserved.